Does this sound familiar? ‘We know our data’s bad, but we don’t have the time or resources to fix it’. There’s still a lot of confusion out there about the role and scope of an analytics audit. With a free audit tool directly in the app, Littledata is on a mission to change this. Here are some (slightly exaggerated) versions of common objections to doing an analytics audit, and how to overcome them. Okay, not to start this somewhat ironic post with an entirely un-ironic objection, but not understanding the process is probably the only good reason not to audit your analytics setup. Luckily an analytics audit is actually very straightforward: it’s simply a check of your analytics configuration and implementation. Some consultants and last-gen apps can make the audit process seem confusing and disorienting. If that’s been your experience, we’re here to help. Our free Google Analytics audit tool explains the process in real time. Not only that, but many tracking and reporting issues can be fixed automatically by the app (hello, intelligent algorithm!). There are a lot of fluffy tools out there. Google Analytics isn’t one of them. It’s not that all digital marketers take action based on analytics, but a majority of the top ones do. That’s what makes them the best. If you need convincing that accurate data is the secret sauce behind higher marketing ROI (return on investment), check out the recent Google Analytics research with Econsultancy, where they found that ‘60% of leading marketers routinely take action based on analytics, and are also 48% more likely than mainstream marketers to say their strategy is strongly data-driven’. Failing to audit your analytics setup is basically the same as believing that everything you read online is true, no matter the source. Why? Because bad data produces bad reports. This is true no matter how fancy your reporting templates might be, or how much time you’ve spent making spreadsheets of Google Analytics data look accessible. Unless you regularly audit your analytics setup, how do you know if you’re tracking the right things in the right manner? This is especially true if you’re using an otherwise awesome ecommerce platform like Shopify, which has notoriously questionable tracking that also happens to be easy to fix with the right analytics app. Customer happiness isn’t just a buzzword, it’s increasingly what’s driving the growth and expansion of online businesses, especially in the ecommerce space. Big players like Amazon learned this early on, and they built an effective – and addictive – customer experience around heaps of data on everything from affiliate ads to repeat buying activity. Think you don’t have access to those same tools? Think again. 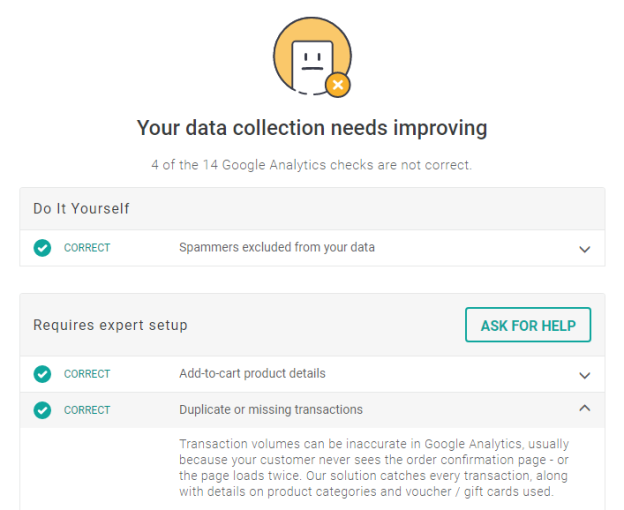 If you want to build a better customer experience, it’s essential to start with the correct Google Analytics setup and end the guessing games about where your leads and customers come from, and how they act. That’s where the audit comes in. Are you betting that your own company will fail? Unless you secretly run an ecommerce hedge fund and have shorted your own startup, this is probably a bad idea. Auditing your data tracking across the customer life cycle is a sure way to see what’s working, what’s not, and what can be improved. Otherwise you’re stuck with bad data and revenue tracking that might not have much to do with the reality – or the future – of your online business. Look, we get it. Change can be scary, but choosing to stay stuck in the same data rut isn’t the way forward. We’ve helped over a thousand online businesses fix their Google Analytics setup to capture accurate, relevant data. 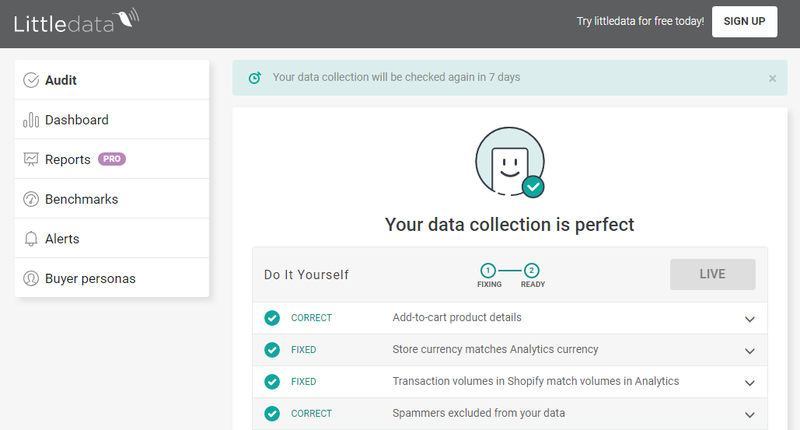 Littledata’s industry-leading automated audit tool is free to run as often as you’d like. Sign up today and start trusting your data.